We had a much-needed day of rain on Tuesday. It started mid-morning and lasted into the evening. Daytime temperatures dropped into the 80's, which was a welcome change. The rain was gentle enough to soak into the soil. If we get more rainy days like this, we may be able to look forward to a nice spring wildflower bloom. But it would take a LOT more days like this to end our multi-year drought. It rains on the umbrellas here, and on the ships at sea." We were removing some dried sunflowers from our front yard, when we noticed a colorful insect flying past at about eye level. Initially, all we could see was a reddish blur. It didn't look familiar so we followed it over to the sunflower plant it landed on, to see what it was. The insect landed on a leaf, then quickly crawled and hid on the underside. After a bit of searching (and patience), we were able to re-find it and get some pictures. 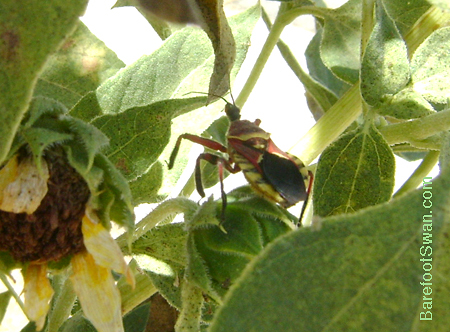 Bee Assassin Bug, Apiomerus spissipes. This colorful insect gets its equally colorful name from the practice of lying in wait for prey, then seizing and stabbing it with its sharp beak (proboscis). It injects a digestive secretion which paralyzes the victim and liquefies the internal tissues. The fluids are then sucked out through the straw-like proboscis. The sharp beak is segmented, and can be folded back into a groove between the front legs when the insect is as rest. 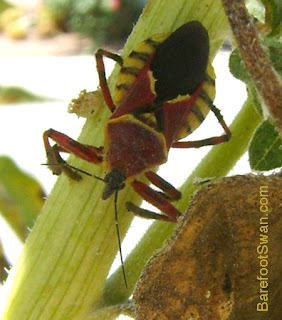 The Bee Assassin Bug has strong forelimbs, with short hairs that help it hold onto its prey. In addition to bees, this predator also feeds on caterpillars, beetles, and insect pests such as flies and mosquitos. In spite of its name, its affect on the bee population is minimal so it is generally regarded as being beneficial in the garden. 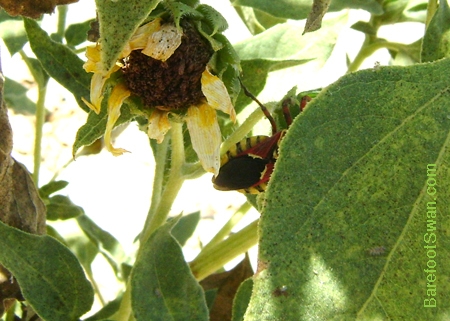 Many people refer to any insect as a "bug", but bugs are actually a certain type of insect. 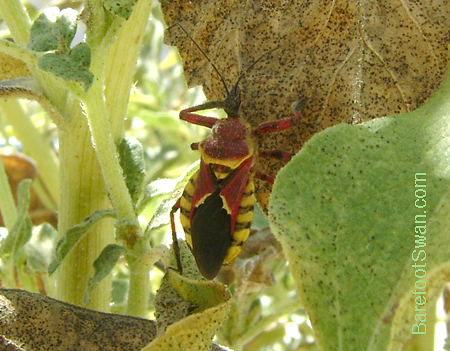 True bugs (order Hemiptera) have specialized mouth parts made for sucking - either plant juices, blood, or animal prey. Other common true bugs include cicadas, leafhoppers, aphids, stink bugs, bed bugs and kissing bugs. "Sometimes opportunities float right past your nose. Work hard, apply yourself, and be ready. When an opportunity comes, you can grab it." 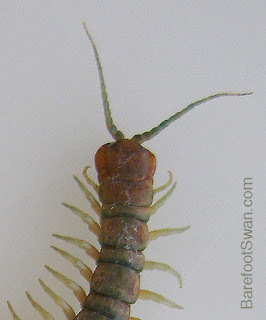 We found a large - and very lost - Desert Centipede in our house. It had likely come inside looking for a cool, dark sanctuary (not sure how our workout room fit into that plan...). We quickly and gently guided it into a Tupperware container, and took advantage of the opportunity to get a few pics. There are thousands of centipede species worldwide, and they live in varied habitats: from deserts and rainforests, to caves and even above the arctic circle! Our local desert centipede, Scolopendra polymorpha, reaches a length of 4-5 inches. There is a lot of variety in the coloration of this particular species, which explains the polymorpha part of its name. (The smaller centipedes we find in our garden are usually a beautiful shade of pale aqua-green.) Centipedes avoid daytime heat and bright light, normally staying hidden under rocks or bark, in leaf litter or crevices. They are most active at night, hunting for insects, small lizards and rodents that make up their diet. Although the word "centi-pede" suggests hundred-legs, most centipedes don't actually have that many. Each segment of their body has one pair of legs, except for the first segment which has pair of modified pincers used for gripping their prey and injecting their venom. Although our local centipedes are not poisonous, they can administer a nasty pinch if threatened. Desert Centipede has a lonely love life. Encounters between centipedes don't usually end well, since they are aggressive and carnivorous. Male centipedes normally just leave a packet of their genetic material where they hope a female centipede may come across it, and impregnate herself with it. A more daring male may do a little dance to entice a female to come closer. When we finished taking pictures of the wayward centipede, we moved it outside and gently placed it on the shady leaf litter beneath our ruellia bush. 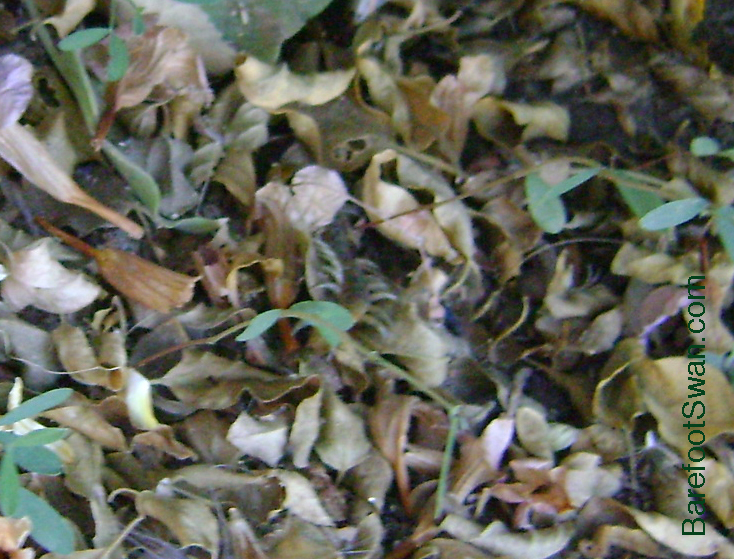 It quickly dove down into the leaf litter before I could even get the camera focused for a picture. The last couple segments of the centipede are barely visible in the center if this image, as it happily returned to a more comfortable and appropriate habitat. "Be sure your put your feet in the right place, then stand firm." Welcome! We are a husband and wife team, and have been self-employed in the creative arts for over 20 years. Bruce is a general contractor with a background in wood working. Sandy is a commercial artist, published illustrator and screen printer. Our hobbies include Hiking, Gardening, Birding, Astronomy (especially chasing total solar eclipses) and Travel - most recently to Tanzania, Egypt and China. The purpose of this blog is to share our interests, and our experiments with our own backyard habitat. We hope you will find inspiration and ideas that will help you enjoy, learn about and appreciate the natural world we all live in. Thanks for visiting!